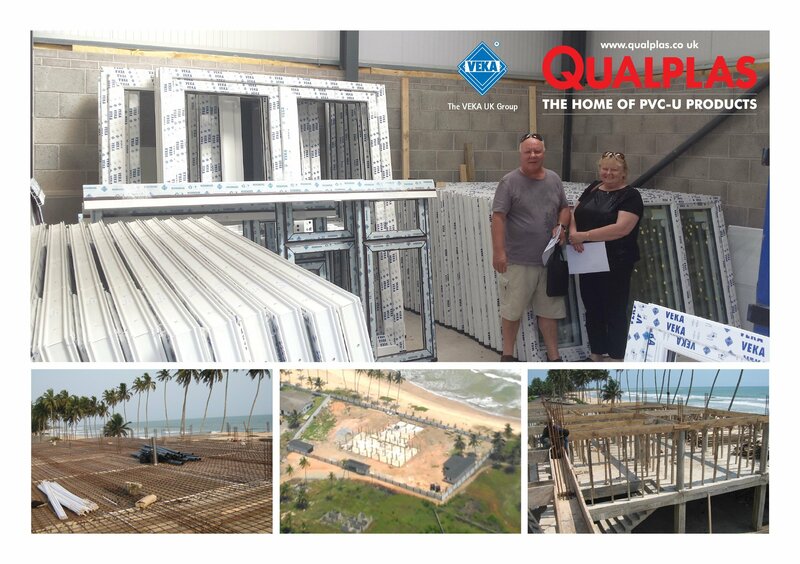 St Helens-based VEKA fabricator, Qualplas has recently fulfilled one of the more unusual contracts of its 25-year history by manufacturing windows, doors and French doors for a residential project, under construction in Ghana! The contract was referred to Qualplas via The VEKA UK Group website following initial contact from contractor Barry Alger, who is coordinating the project from his beachfront property nearby. Andrew Smith, Qualplas‘ Managing Director explains: “Barry was sold on using VEKA systems having been so impressed with the durability of the units installed on his own property, which neighbours the new development. The new development is situated on Victoria Beach near Takoradi, Ghana, and will consist of 24 serviced apartments, office facilities, a bar and restaurant area overlooking the seafront and a bathing area / swimming pool. Oil has recently been discovered in the region and it is envisaged that a company involved in that industry will lease the entire purpose-built development for the use of its workers. The significant size of the project meant Qualplas received an order comprising around 40 Matrix 70 windows, 19 sets of French doors and additional residential doors. VEKA door and window systems are therefore used exclusively throughout the development, paying testament to Barry’s confidence in their weather resistance and technical performance. Colin Torley, Sales and Marketing Director for The VEKA UK Group added: “Qualplas‘ commitment to fabricating VEKA systems not only secured the company this fascinating contract but reassured the customer that the products he chose have been thoroughly tested to withstand the world’s most unforgiving climates.